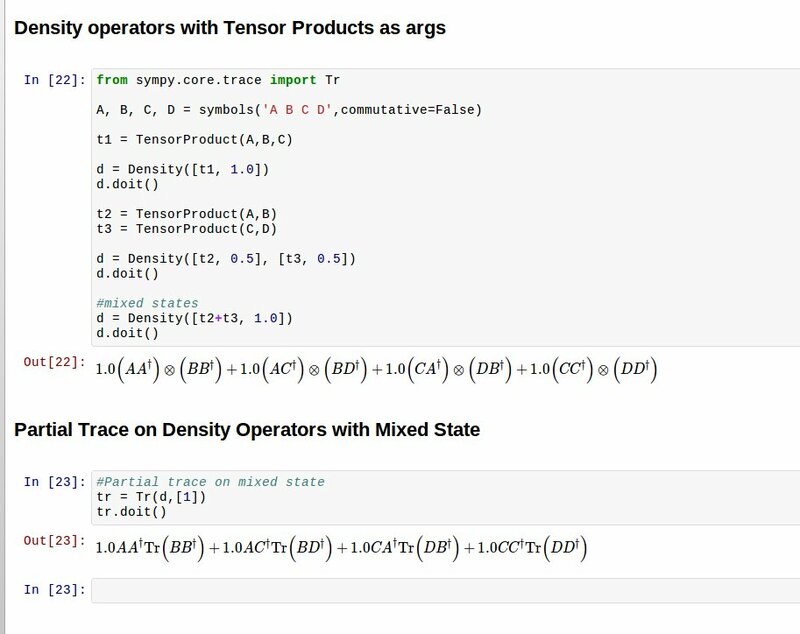 This week I continued to work on the Tr operator and the related code needed for partial trace operations. Following up with the list of tasks I had listed out for this week, I got the following items accomplished this week. 1. Printing ( default, latex and pretty). The current output does not display the indices. I would like some input on this from the reviewers on how to incorporate the information on indices into the output. 2. Handles indices in the constructor of Density class and related methods. Handle partial trace operations especially wrt to Density operators. The activities I have in mind for next week are as follows. Address review comments on latest PR. 2. Complete the test cases for existing partial trace implementation for Qubits. My plan is to get this changes merged with the current PR. This should happen by Tuesday. qapply() method to incorporate density op L and R operations. BTW, for Emacs lovers and who love IPython Notebook, there is IPython notebook for Emacs now. I have not tried this yet, but I plan to try this out this week and post my experience.